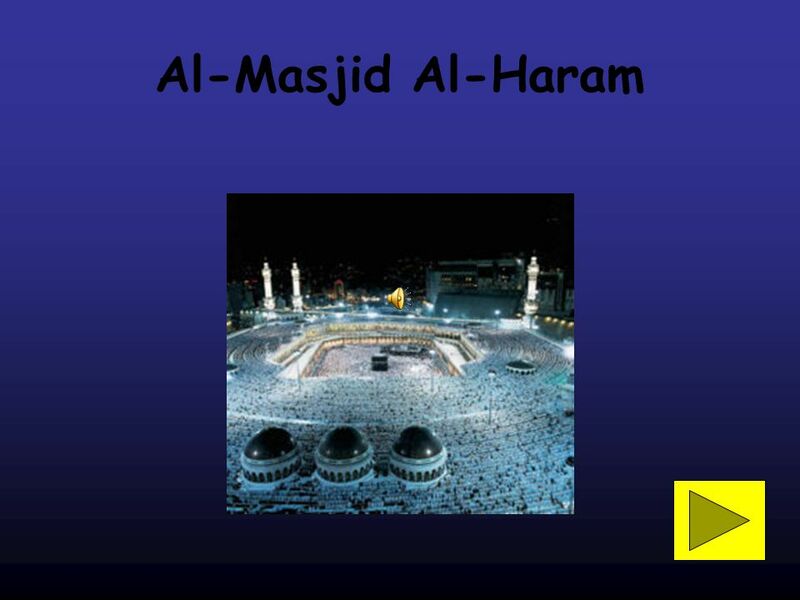 2 Masjid Al-Haram is a large mosque in the city of Mecca, and the largest in Islam. 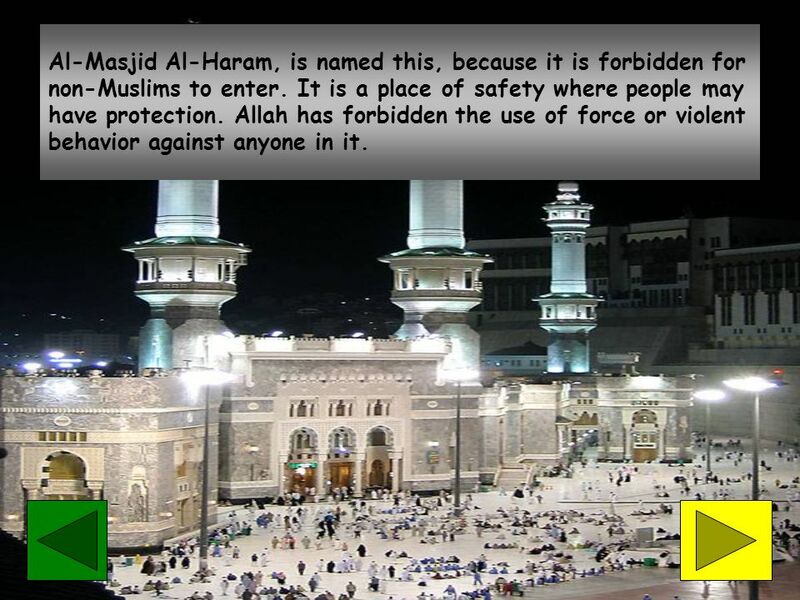 5 Al-Masjid Al-Haram, is named this, because it is forbidden for non-Muslims to enter. It is a place of safety where people may have protection. Allah has forbidden the use of force or violent behavior against anyone in it. 6 Allah predestined a place of worship on Earth to reflect the house in heaven called al-Baytu l-Mamur, which means 'The Worship Place of Angels'. Al-Baytu l-Mamur is directly above the Kaaba, in Jana. 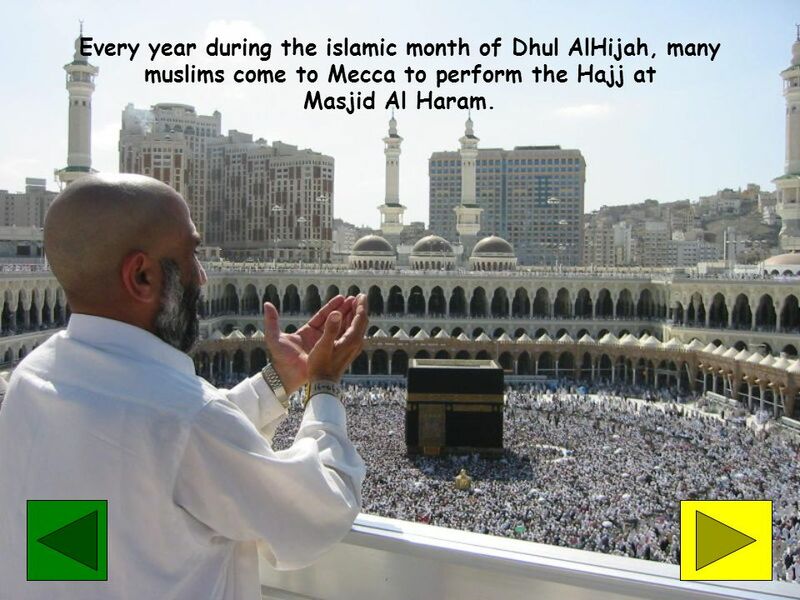 7 Every year during the islamic month of Dhul AlHijah, many muslims come to Mecca to perform the Hajj at Masjid Al Haram. 8 Salla Allahu Alaihi Wa Sallam. Prophet Muhammad. 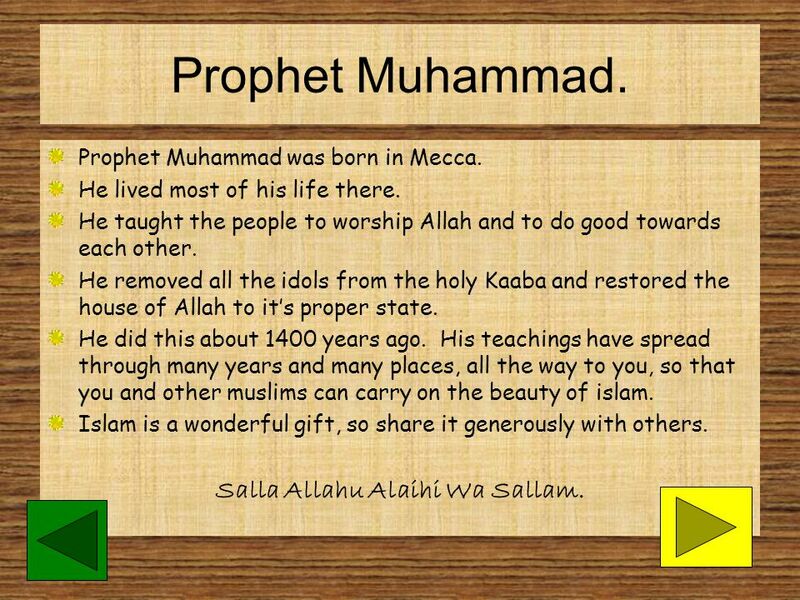 Prophet Muhammad was born in Mecca. He lived most of his life there. He taught the people to worship Allah and to do good towards each other. He removed all the idols from the holy Kaaba and restored the house of Allah to it’s proper state. He did this about 1400 years ago. His teachings have spread through many years and many places, all the way to you, so that you and other muslims can carry on the beauty of islam. Islam is a wonderful gift, so share it generously with others. Salla Allahu Alaihi Wa Sallam. 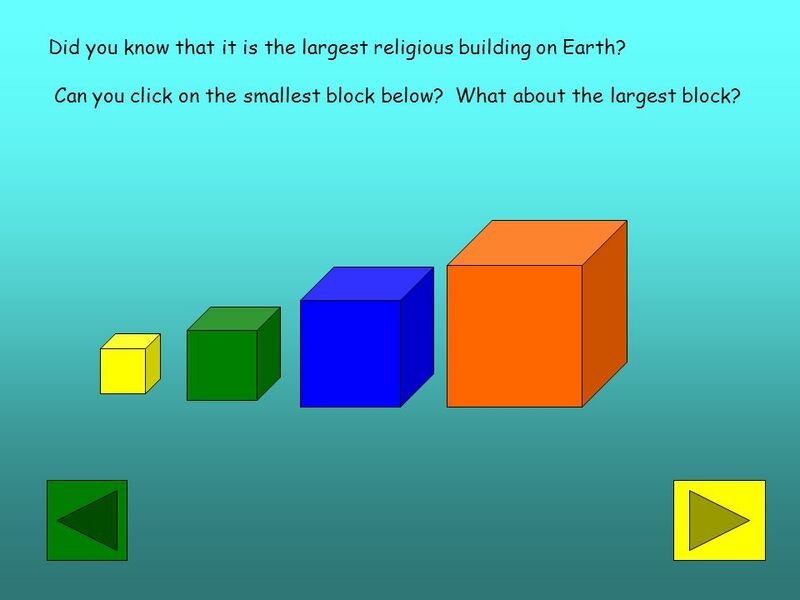 9 Test what you know. 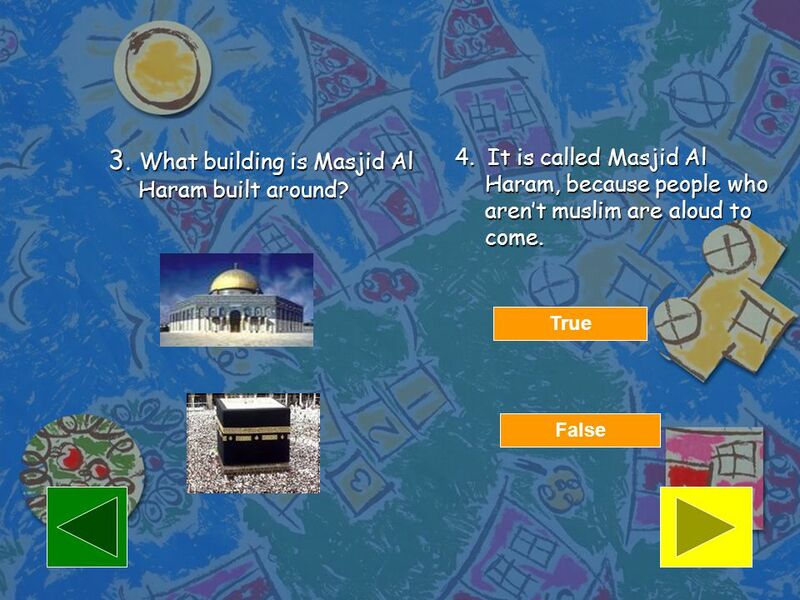 Click on the correct answers. 10 3. 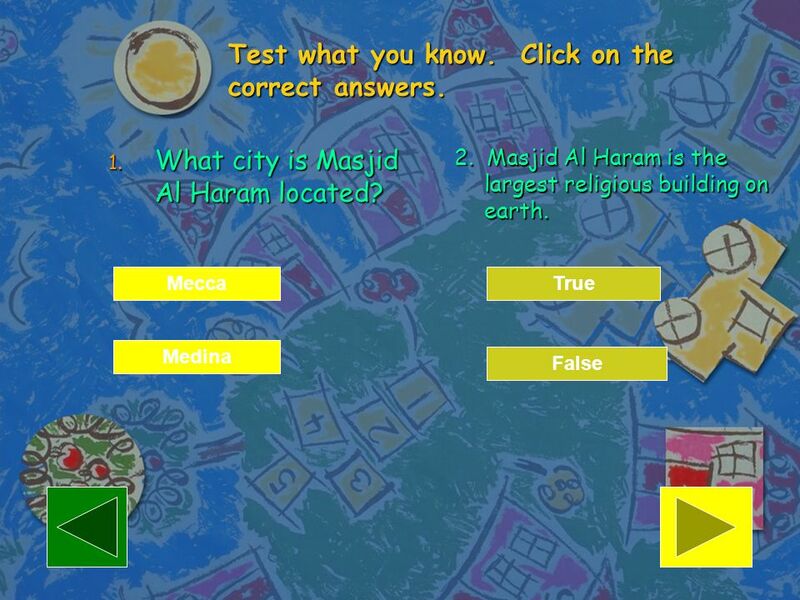 What building is Masjid Al Haram built around? 4. It is called Masjid Al Haram, because people who aren’t muslim are aloud to come. Try Again Try Again True False Masha Allah! Masha Allah! 11 6. 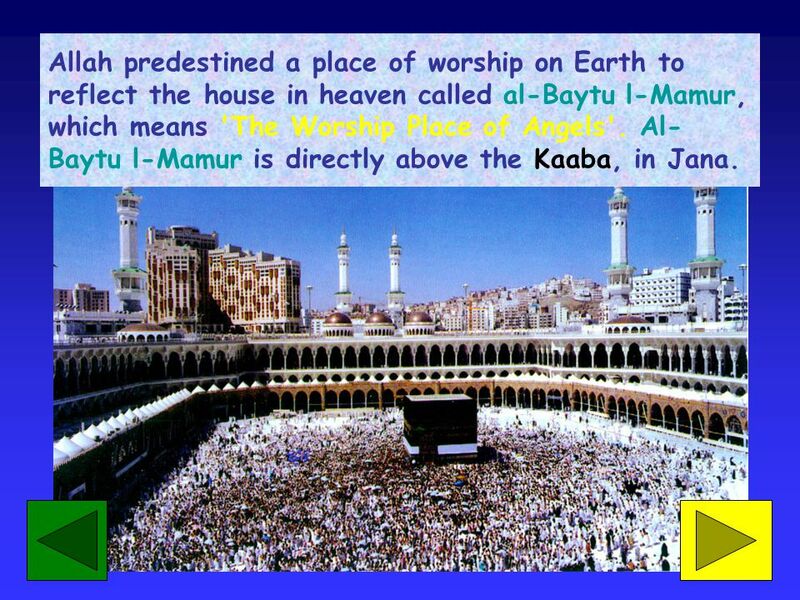 Al Baytul Mamur is directly above the Kaaba in Jana. 5. 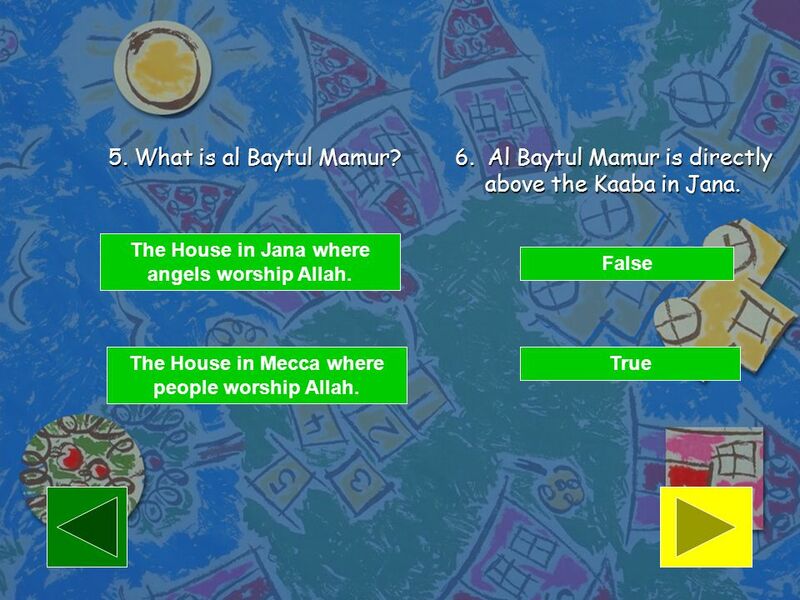 What is al Baytul Mamur? 6. Al Baytul Mamur is directly above the Kaaba in Jana. The House in Jana where angels worship Allah. False Try Again. Masha Allah! The House in Mecca where people worship Allah. True Masha Allah! Try Again. 12 Al Imran 3;96 Verily, the first house (of worship) appointed for mankind was that at Bakkah (Mecca), full of blessings, and a guidance for Al’Alamin (mankind and jinn). Dromedary Camel Bactrian Camel Middle East Asia What does each camel tell you about the environment that they live in? What can you infer about each climate? Helga design Al-Haram Mosque, Mecca Mosque by night. 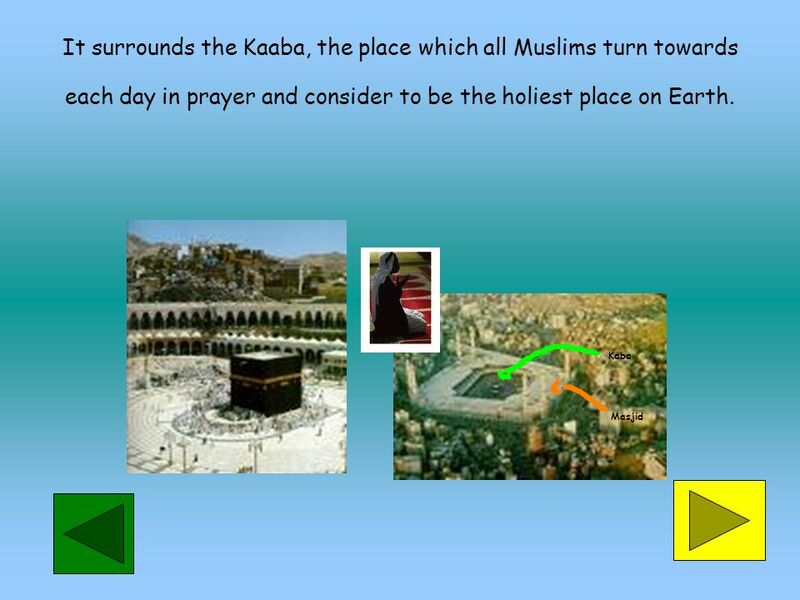 Muhammad’s escape from Mecca to Medina is know as the: Hajj or Hijrah? Submission to the will of Allah: Islam or Muslim? Muhammad: Last of the prophets. What holy places can you name? Say what makes them holy.. Jerusalem - Christians Lourdes - Catholics Ganges (Varanasi) – Hindus Bodhi tree - Buddhists.